This recently commercialised device provides electronic measurements of the ocular refraction, of the corneal curvature and of the intraocular pressure simultaneously on both eyes, in less than a second. All four measurements are made by a single apparatus, for the convenience of the patient. This device provided very fast measurements of the optical power of glasses. It also measures lens type, lens distortion and UV transmission. In combination, these two fast and complete devices gives a precise picture of patient vision and of the visual functions, such as contrast vision for example. In contrast to manual measurements, the use of automatic and digital devices leads to more objective and reproducible measurements. The biomicroscope is a microscope equipped with a slit lamp which lets light shine on each individual part of the eye separately, thus enabling a study of every part of the eye, from the cornea to the the retina. The optical resolution of the microscope is 10microns, which enables the practician to perform a very detailed examination. This device examines the visual field of each eye, when the eye does not move and fixes a light dot situated in front of it. This is useful for examinations in connection with driver’s licences and most importantly for the diagnosis and follow-up of glaucoma and of neurological pathologies. It features a sophisticated range of evaluation strategies which are invaluable to glaucoma specialists. 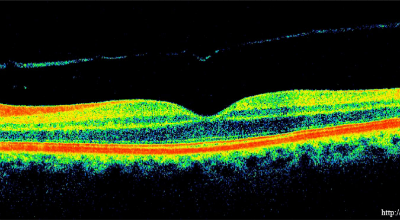 OCT stands for optical coherence tomography and is a technique which enables real-time measurements of retina thickness with a resolution of a few microns, and also to detect common pathologies or the retina and of the optic nerve. 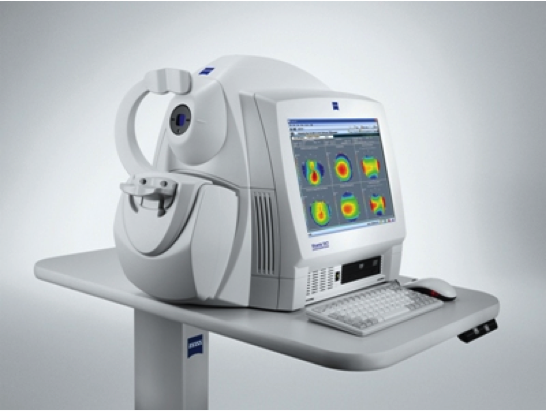 It has developed into an important state-of-the-art examination for screening and follow-up of a number of pathologies, including glaucoma, diabetes and age-related macular degeneration. This technique is used to automatically collect and analyse information about the corneal curvature. The images obtained enable the surgeon to follow a corneal pathology and to plan a precise refractive surgery, with or without implant, or in the case of astigmatism to plan a cataract surgery with implant. The optical biometer is used to perform certain measurements of the eye, such as axial length or corneal curvature. 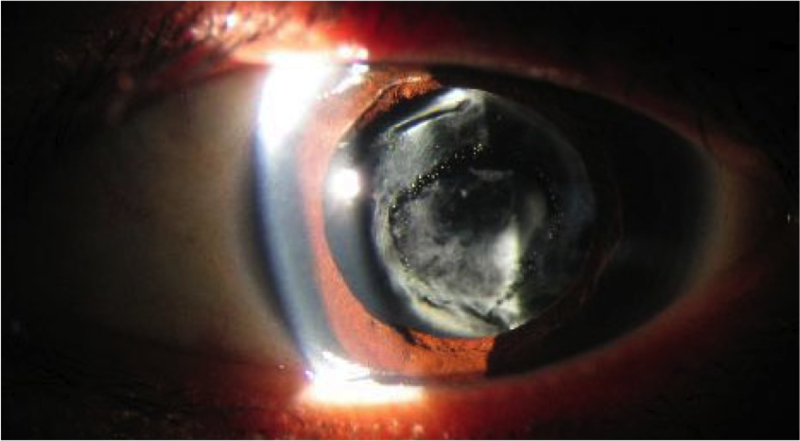 The data are then use to calculate the optical power of the intraocular implant which will replace the crystalline lens when cataract surgery is performed. This device is used to count the number of posterior corneal cells per mm2 required for the introduction of an implant in e.g. the anterior chamber of the eye. The Nd:YAG laser is used in ophtalmology in order to open up the secondary opacification which may form a few month or years after cataract surgery, or to perform an incision of the iris for a glaucoma treatment. We have only mentioned the principal uses of the device which however has a number of other applications. The SLT laser is a top treatment of glaucoma which makes it possible to lower the intraocular pressure by repeated application of laser pulses on the trabeculum, which is the ocular tissue responsible for the elimination of the acqueous humor of the eye.